Manufactured in Allemagne from 1951 until 1955. This Ikonta is also known under the name of Mess-Ikonta. Mess means measurement because it is equipped with a rangefinder. This pretty horizontal folding camera has an uncoupled rangefinder. The adjustment of the telemetric aiming is done while turning the button located on the left on the top. It is then necessary to defer the distance read on this button, while turning the frontal lens. The release is located on the body. There exists with various combinations of shutter and lens. 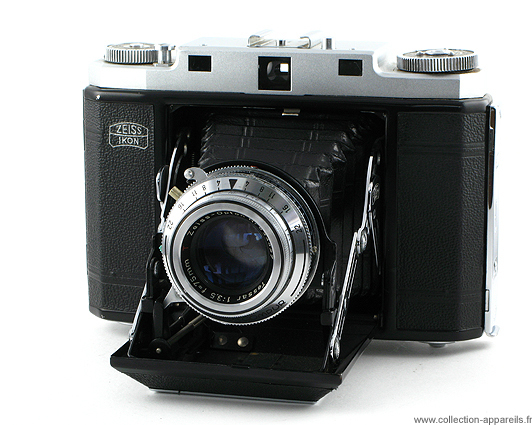 This # A1804 with a Synchro-Compur shutter and a Tessar 3,5/75 mm lens.